The Best Fluffy Oil-Free Hummus made with seven ingredients and ready in ten minutes flat. 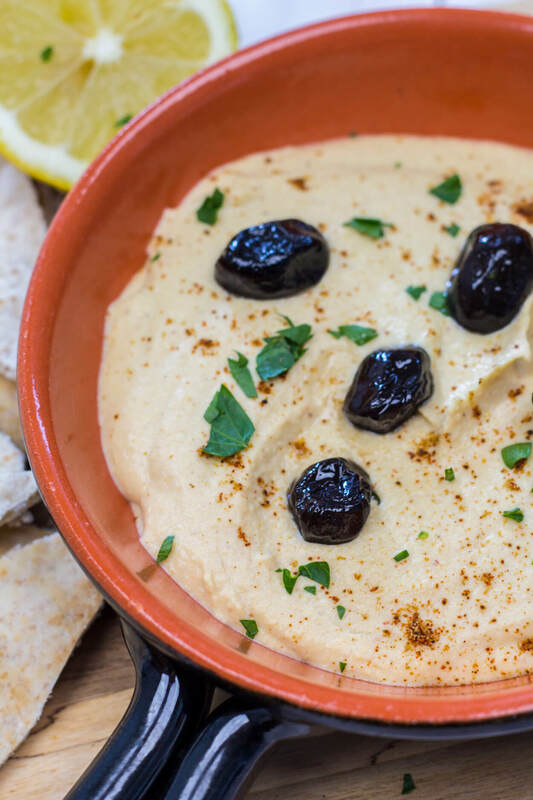 With a few simple tricks for making the best homemade hummus, you’ll never want to buy hummus from the store again! Raise your hand if you love HUMMUS! Me, me, meee! Hummus is one food I could not live without. It might be stereotypical as a vegan, but Hummus truly is a staple in my daily diet. I always have some in my fridge to enjoy with freshly chopped veggies, serve as an easy appetizer, on burgers, or even use as a dip with homemade fries. You can just never go wrong! I even had hummus with some pita and cucumbers for breakfast this week. I am sure we can all agree that Homemade Hummus really is where it’s AT. 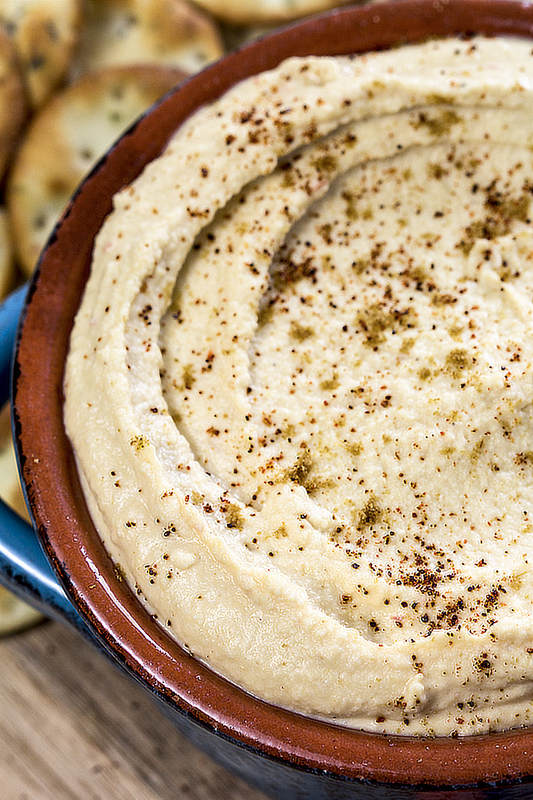 When you make hummus from scratch, it really does taste that much better than store-bought. It also is probably one of the easiest recipes to make. It takes all of 10 minutes from start to finish. That means you are only TEN minutes and SEVEN ingredients away from Homemade Oil-Free Hummus bliss. 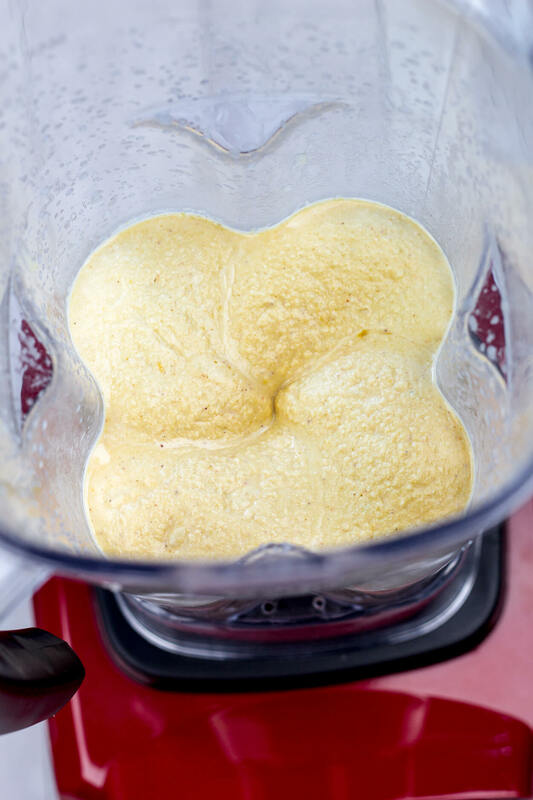 Hummus in a high-speed blender is super creamy (like the hummus you buy in store) without any peeling required. Add all the ingredients to a high-speed blender and blend away! If you don’t have a high-speed blender at home, this is the one I use – it’s very effective and doesn’t break the bank like a lot of the high-speed blenders out there. Add a bit more liquid than most recipes call for. Since you are blending your Oil-Free Hummus, you’ll need a little bit more liquid to get the hummus blending until it is creamy smooth and fluffy. Hummus also naturally thickens in the fridge, giving it the perfect creamy and fluffy consistency. Don’t skimp on the tahini. 1 or 2 tablespoons won’t cut it. Tahini gives hummus it’s distinct flavor. I use 1/3 cup of tahini in my Oil-Free Hummus. This probably goes without saying, but use freshly squeezed lemon juice. This really makes all the difference in the flavor of the final result. If you make this Oil-Free Homemade Hummus at home, leave your feedback below, snap a shot and tag me #CearasKitchen on Instagram – I love hearing from you! XO. 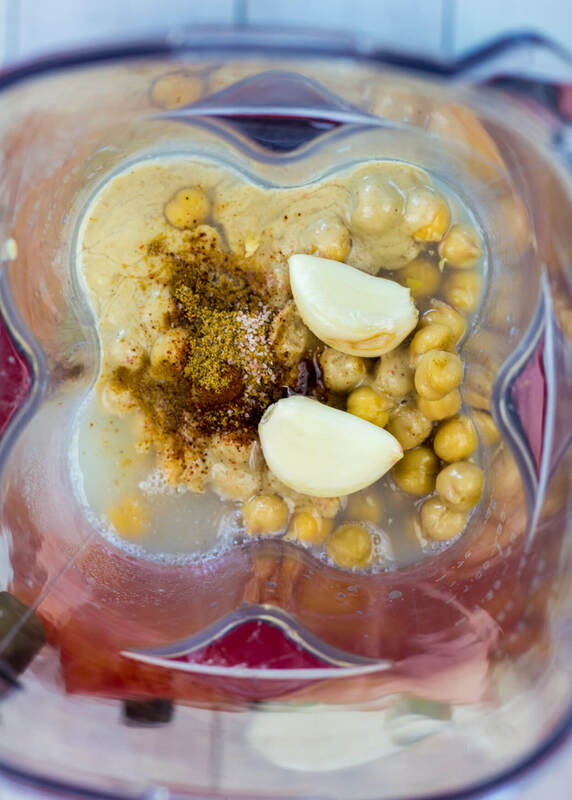 Add chickpeas, 1/4 cup aquafaba, lemon juice, tahini, 1 clove garlic, chili powder, cumin powder, and sea salt to a [url href=”https://www.amazon.com/Salton-BL1486CPBT-Harley-Pasternak-Blender/dp/B0185E8536/ref=pd_sbs_79_5?_encoding=UTF8&psc=1&refRID=FBZYQXKDSTPP2HZ5563J” target=”_blank” rel=”nofollow”]high-speed blender[/url] (or food processor). Blend, blend, blend until creamy (1 to 2 minutes). Scrape the sides of the blender halfway through blending. Taste test and add additional garlic and sea salt to taste. Add additional aquafaba by the tablespoon (I use 1/3 cup aquafaba total when I make hummus). Add hummus to a bowl or deep plate. Garnish with cumin, chili powder, and parsley. Enjoy! 1) I’ve been getting a lot of question about what aquafaba is – aquafaba is the cooking liquid of chickpeas. It is the liquid found in the canned chickpeas cans or the liquid left over from cooking your own. [br]2) Make sure the tahini you use in this recipe is oil-free, for this recipe to be 100% oil-free. And if you’re craving some Hummus with a kick, try my Roasted Garlic and Harissa Hummus recipe. 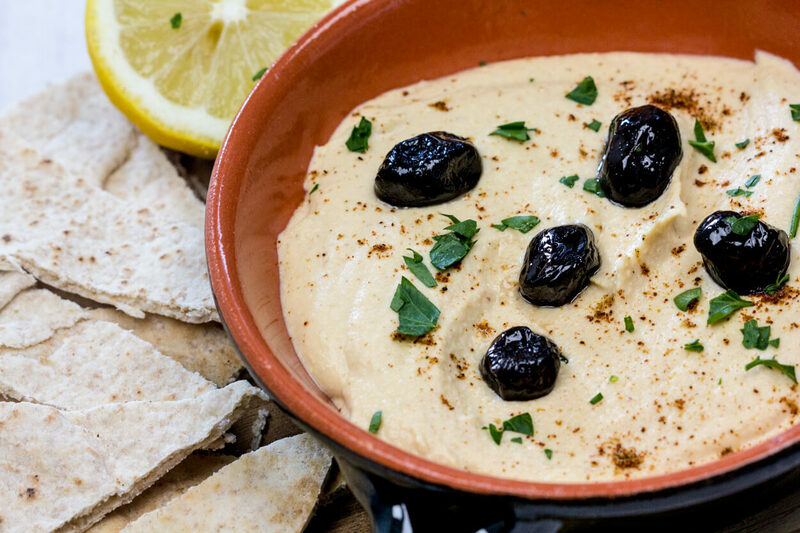 You mention at the beginning of this oil free hummus recipe that there is a video, but I don’t see the link for the video. Where do I find the video? Thanks very much. This is indeed the best hummus I’ve ever made – oil free or not. I added extra garlic, a quarter cup of salsa, and 2 small pickled jalapeño peppers. So delicious! Very creamy! Love it. It’s my go-to for Basic hummus. I modified this recipe later and made a black bean version with roasted garlic. It was amazing. Truly the best hummus I’ve ever had. So creamy, light and delicious. I used Za’tar Instead of cumin,. this is a great base recipe which I can’t wait to make with other flavors. Thanks so much, Ceara! Hello! Would you know the nutrition facts of this recipe? Absolutely delicious! Fluffy and easy to make. I just wish I would have left out the cumin. Not a big fan of cumin but even without seasoning it would be amazing! Besides oil free, I need to cook without citrus and vinegar. Any suggestions for replacements. This was wonderful! I will never buy store bought hummus again. I didn’t season mine at all, and I love it! I wanted to start off as plain as possible and season in the end, but I loved it plain. Thank you so very much! I just made this, and ooooooooh my goodness!! So easy, so fast, SO DELICIOUS! Thank you for posting this. It’s perfect! Ok – so I’m slightly tardy to the party but this is a delicious hummus. I’ve been laboring over recipes that take twice as much effort and time. I whipped this up in just a few minutes. Thank you Ceara. Gonna put this recipe in my go to’s. Could I use just plain seseme seeds instead of tahini for this recipe? 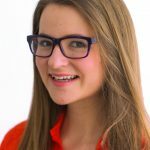 I think the confusion about oils is brought about by our understanding of harmful refined or processed oils as against the beneficial fats we get directly by eating whole foods. I do not think they are the same. THANK YOU so much for this recipe! I’ve tried to exclude processed oil in my food for a year or so, but I’ve struggled with my hummus. If I was lucky, it turned out just right, but most times it turned out boring and tasteless. I’ve just tried this recipe for the first time and it turned out perfect in the first try. I followed the recipe as it is and didn’t feel the need to add more spices or garlic. This will be my go-to hummus recipe from now on! Thank you for this! I just went “added oil-free” – which is so often confused with” fat-free” as seen in some comments here and elsewhere – thank you for clarifying that tahini is a seed butter, in the way that almond butter is ground up almonds, or a smoothie is processed fruits & veggies – not an extracted oil, so it’s a whole food. ANYWAY, this was delicious. I skipped the chili powder, doubled the cumin, and added a dash of cayenne and za’atar. My Vitamix was occupied so I used the processor and ran it until it was silky smooth. And the can of chickpeas left me with plenty of extra aquafaba. Is it safe to store the tahini in your pantry? I love this recipe. Ive been struggling for so long to make oil free, tasty hummus and now I can! Yay! So glad you enjoyed the hummus! Thank you for the lovely feedback. I love this recipe! I have made this many times! <3 Most other recipes ask for olive oil AND tahini. My friend opened up an Arabic restaurant and he uses the same ingredients, minus the added chili and cumin (No ADDITIONAL oil in the mix) However, they do blend while warm after soaking overnight. I love this recipe absolutely fabulous! I’m not a total fan of store bought hummus and have tried making my own that did not turn out very well in the past. I am amazed by this recipe. Great Job. I took 1/2 and added artichoke hearts and spinach and gave it a whirl in the blender leaving it a little chunky….both are so good. For those of you wondering about the fat…maybe search Whole Food Plant Based and see what you find…it’s been a wonderful way for me to eat…Maybe it’s something you will want to try. Nut butters oils are used. This recipe is not oil free or fat free. And there is no healthy oil. Just saying. There’s about 25grams oil in 1/3cup tahini, which is more fat than I take in each day. I wonder if enough oil rises to the surface to appreciably reduce the fat content by just pouring it out rather than mixing it in. At least the flavor would be there. Tahini is sesame seed oil. So there is oil in this recipe, just not olive oil. Tahini is not sesame oil…….it is ground sesame seeds, so it is a whole food. She used a brand with no added oil, such as Baracke brand, which has only one ingredient, ground sesame seed with no added oil or other ingredients hello. You don’t need to peel the chickpeas, the trick is to overcook them on low heat and blend them while hot (authentic hummus restaurants will cook them overnight). Once you cook your hummus, don’t worry about Aquafaba, you will have enough stock to control the texture to your liking. Tahini is a oil in disguise… just leave it to rest in a clear jar for few weeks and you will see more than 1/3 is made of oil. If overused – apart from fat content – it tend to overtake the texture of the hummus and definitely its taste. Your hummus (aka chickpeas in Arabic) will end up very creamy but be mostly made of stock and tahini. So what exactly are you saying about the tahini? Don’t use at all or use a smaller amount? When cooking the beans overnight, how is this done? Do you start with dry chickpeas or canned (I’m guessing dried). Also, do you put any tahini at all in with this method? I’m looking for a way to have no added oil, and no tahini in my hummus, and still have it turn out creamy/moist! I found that you can use a slow cooker overnight to cook the dry chick peas, on low 8 hours, using 1 1/2 cups of chick peas to 7 cups of water. Works like a charm and yields enough for two batches of hummus. Is the 1/4-1/3 cup of aquafaba in addition to the aquafaba from the can of beans? Not in addition to! Just 1/4 – 1/3 cup of aquafaba. Hope this clears things up! I made this twice today, once with 1.5 cups of chickpeas and the second time with 4.5 cups. Both recipes turned out perfectly. Very flavorful, nice texture. Definitely my go to recipe from now on. In answer to Lizzie’s question, tahini does not (or rather, should not have) refined oil. The oil comes from the sesame seeds, which is different than the refined oils from the bottle that are used for making commercial hummus. The fat from sesame seeds is healthy fat of the type that is found in nuts and seeds. Thanks again for this great recipe. This is exactly what I was thinking about. Tahini is made of sesame seeds so there’s no way it’s oil free. Hi Anuh! Tahini is a seed butter made by processing sesame seeds – there’s no added oil in this recipe. Make sure the tahini you are buying just says sesame seeds to make sure there’s no added oil! I realize I am splitting hairs, but doesn’t the tahini have oil? I think what he’s saying is that sasame seeds (and hence tahini) are 50% fat, so you can’t add a load of tahini and claim it’s oil free, as you’re adding oil in the form of the tahini.